Hosts are very friendly and helpful. Hostel is very clean and cozy. If you want to have some peaceful and calm rest at the seaside you surely shoul go to the Tossa-de-Mar to the Mana Mana hostel. Very good location, it's about 3-5 minutes close to both beaches. Next street to the sea is the line with all shops and restaurants. Hosts will tell you just everything about city and surroundings. This hostel has pretty terrase with beautiful view. Don't miss your chance! Located in Tossa de Mar's historic town, Manà Manà Hostel is just 40 metres from Tossa Beach. It features a communal kitchen, a bar, lounge and a chillout terrace. The bright, colourful rooms at Manà Manà have simple décor and include bed linen. 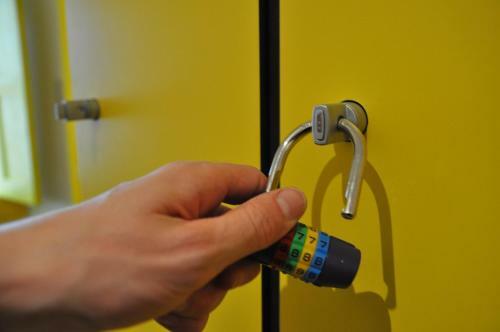 There are also lockers, and there is access to private or shared bathroom facilities with free toiletries. Towels are available to rent. Free Wi-Fi is available throughout the building. There is a TV and DVD player in the lounge, and at reception there is a computer that you can use for free. Staff at reception can provide information about on-site events as well as what to see and do in Tossa. The property is located on a small, quiet street, close to Tossa's bars and restaurants. Barcelona is 85 km away, while Girona is a 45-minute drive away. Regular buses to Barcelona leave from the bus station, located 5 minutes' walk away. Tossa de Mar is one of those typical coastal towns of the Empordà, where we find the pines growing and reaching sea, almost touching the water. Tossa's economy, some centuries ago, was based on the cork and wine industry. However, the filming of 'Pandora' in 1950 (starring Ava Gardner), parallel to the beginning of the village as a tourist destination on the Costa Brava, turned this beautiful coastal location into one of the best known around the world. For this reason tourism has become the main economic engine of the town during last decades. Tossa's origins are pre-Roman. Known as Turissa, it enjoys an exceptional geographic location, situated between Lloret de Mar (south) and Sant Feliu de Guixols (north). To get there you must take the road GI-682, which passes through the two mentioned locations. Both coming from Lloret and from Sant Feliu, the views from the road are fantastic. It is almost obligatory stop at one of the many panoramic viewpoints marked through the edge of the road to watch and take pictures of the views of the creeks that are visible from there. Through this way you can access beautiful and spectacular beaches such as Cala Giverola, Cala del Senyor Raimon, Cala Vallpresona, Cala Canyet, etc. From Roman times Tossa still keeps the villa of Els Ametllers, located in av. of Pelegri, 3-5, near the Torre de Sant Magí (St. Magí Tower). Discovered by Dr. Ignasi Melee in 1914, it has its origin in the first century BC and was inhabited until the sixth century AD. It's really a great honor to Tossa to have one of the best towns in the former province of Tarraco, which has survived until today. In els Ametllers the owners cultivated grapes and exported wine to the rest of the Roman Empire. It is therefore a classic example of farming in the Mediterranean area dominated by the Romans. Already in the center of town, you have to visit the walled enclosure, which is exactly the Vila Vella de Tossa. Listed as National Historic-Artistic Monument by the Spanish government, its walls now represent the only example of a fortified medieval town on the Catalan coast. It is composed of seven watchtowers (including, for example, d'en Joan, Codolar and Heures). It is highly recommended to walk through the streets of this small walled area and get to the Faro de Tossa (Tossa Lighthouse), which overlooks a magnificent view of the rocky coastline south of village. Tossa Lighthouse (1917), located on the highest part of the Vila Vella de Tossa has become the Lighthouse Interpretation Centre (Centro de Interpretación de Faros) of our coastline. This innovative equipment in the museum domain is a point of reference for all those interested in the world of maritime signals. It is an audiovisual center, adapted to visitors in several languages that teaches us the history and the different technologies used in the world of lighthouses and the lifestyle of their guardians, the lighthouse keepers. The space devoted to museum gives us the chance to see different parts of this maritime heritage. Outside the Walls, bounded by the streets Portal and Estolt, you find the district of Sa Roqueta, a traditional place of fishermen formed in the first stage of Tossa urban expansion, back in the XVI century. Further, following the street Portal, is the commercial center of town. The walk along the seafront of Tossa, from the walls to the beach of Mar Menuda is also a nice experience. This tour will allow you to enjoy the sea and the spectacular views of the Cape of Tossa and the fortified ancient villa previously described. The Municipal Museum, housed in the Batlle Palace, bears testimony to the passage through Tossa of Marc Chagall, André Masson, Joaquim Sunyer and other painters captivated by this landscape. Tossa boasts fine beaches such as Llorell and Morisca, and one of the most beautiful stretches on this coastline: the road to Sant Feliu de Guíxols (twenty-five kilometres of bend after bend) through the coves of Salions, Futadera, Giverola and Pola. very friendly and helpful staff, awesome roof deck, cleanness of the hostel and the other travelers. One of the nicest Hostels I've stayed in! Facilities all work perfectly and it's clean. Staff were super lovely and friendly and they taught us how to make an awesome Paella! I was looking for a relaxing place to stay that was close to the beach and it was so perfect for me I ended up staying a week! I would definitely go back there again! The staff/ ownerswere extremely kind and friendly and did everything to make sure our stay was enjoyable. The facilities were very modern and super clean. The atmosphere was laid back but not full of drunks like you might get in some seaside hostels. Nothing it was perfect. We would have stayed longer if we could. The best of hostels. Kitchen, lounge, location. Very friendly hosts. A lot of information about place. Situated in Old Town of Tossa de Mar, close to the beach, restaurants and pubs. Friendly and helpful staff, very clean rooms as well as bathrooms. Recommended for friends getaway. If I go again to Tossa, I would definitely stay in the same place. Danny and Marta! Amazing folks who were incredibly accommodating and helpfull. Really made the trip that much better! Hostel is literally 2 minute walk from a stunning beach and castle. Kitchen was great, rooftop terrace was beautiful, very new hostel, very comfortable. Nothing really, this place is everything you could hope for in a hostel. This hostel is just new, the house has been all renovated and the rooms are simple but clean. The double bedroom with its private bathroom (and a crazy shower I must say) is actually as confortable as a hotel room is you don't need a tv or hairdryer, of course. No breakfast but a nice kitchen to share with the backpackers and a very nice terrace on the roof to chill after the beach ! Eigentlich alles. Die Frau an der Rezepción war super super freundlich, zuvorkommend und hat sich wirklich bemüht, es jedem Gast so angenehm wie möglich zu machen. Bei Fragen oder Problemen konnte man jederzeit zu ihr kommen und über alles reden. Sie war auch generell sehr kontaktfreudig. Die Zimmer waren alle sehr sehr sauber und gepflegt, ebenfalls die Toiletten und die Küche. Dieses Hostel zählt unter die Kathegorie Klein ( und unbekannt ) aber fein. :-) jederzeit wieder. Ubicación excelente y habitación correcta. Nuestra habitación estaba al lado de los baños compartidos por lo que habia bastante ruido. Todo me ha gustado. El personal era muy atento y super simpatico.Todo estaba limpio. Yo volveré allí seguramente. Lo aconsejo!!!!!!!!!!!!!!!!! Hostel in bester Lage mit supernettem und hilfsbereitem Personal. Wir hatten ein Doppelzimmer mit eigenem Bad, toll eingerichtet mit faszinierender Dusche. Geniale Dachterasse, um bei einem gemütlichen Bier in den Abend zu starten. Recht hellhörig, je nach Besetzung im Nebenzimmer haben wir zwei Nächte perfekt und eine weniger gut geschlafen - für ein Hostel aber absolut in Ordnung. einfach wunderbar und nur weiterzuempfehlen!!! la situación del hostal es perfecta, estaba todo muy limpio, la habitación sencilla pero con un toque de color que la hace acogedora y el chico que nos atendió era muy simpatico, un sitio agradable para volver sin duda. Hay que dejar la habitación a las 11....es un poco pronto, una horita más seria mejor. Y las campanas de la iglesia!!!!! pero de eso no tiene culpa el hotel, jeje. Me ha encantado la situación y el trato recibido. A pesar de que la habitación doble es pequeña, tiene un baño perfecto, todo está limpio y muy cuidado. Los dueños son encantadores. Tuvimos una estancia muy agradable. ubicado en todo el centro, cerca de todo y en una calle muy tranquila. el dueño, gente joven muy agradable. Me ha gustado mucho la estancia en Manà Manà!El sitio muy bonito y limpio.Y el trato muy bueno y agradable. Os sentireis como en casa!